Follow Germany's last great counter-offensive of the war in this 70th Anniversary special issue. The Allies had gained a solid foothold in Europe after the D-Day invasion, and Operation Barbarossa, Hitler’s audacious plan to invade the Soviet Union, wasn’t going as smoothly as he hoped. So the Führer rolled the dice. Hoping he could repeat history, he mustered up a quarter-million troops from three different armies to launch the riskiest, most costly counter-offensive of the entire war. The plan? 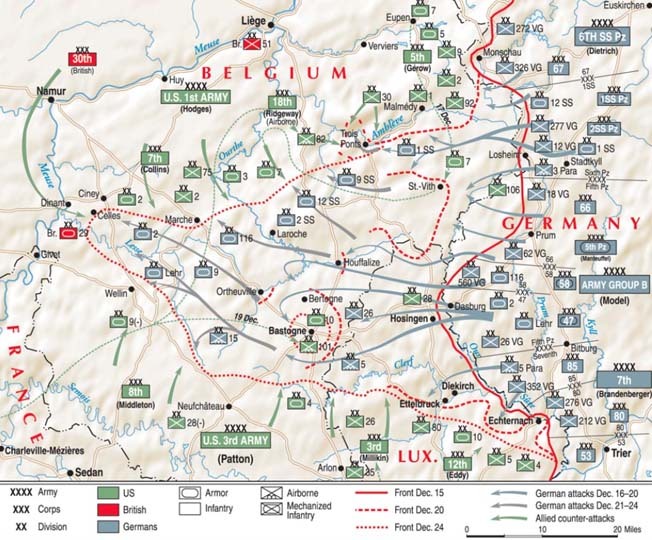 A surprise blitzkrieg through Belgium, splitting the Allied armies through the rugged Ardennes forest. Operation Autumn Mist was born. The men who lived through it call the battle by many names. In Germany, it became known as “Operation Watch on the Rhine.” In France, it was “Bataille des Ardennes.” For the American men who spent the winter of ’44 trapped inside a perimeter 70 miles wide and 50 miles deep, surrounded by 200,000 German soldiers, it was known as the Battle of the Bulge. …And within the pages of this special issue, you’ll get a first-hand look at what they experienced. To commemorate the 70th anniversary of this famous battle, we’ve put together over 100 pages of stories that cover the Battle of the Bulge like never before. Far beyond mere facts and figures, this special report delves into the battle’s personal stories—some heroic, others controversial. At 10:04 AM on January 31, 1945, a single prisoner was bound and blindfolded in the courtyard of a French country house near Ste-Marie-aux-Mines. A detail from the 109th Infantry Regiment, 28th Division fired the volley that carried out his death sentence. With the end of his life, Private Eddie Slovik made history for the U.S. army. He was the first American soldier executed for desertion under fire since the Civil War. No executions had taken place for such a crime for 80 years, and none have taken place since. So why Slovik? And why then? Inside this special report, you’ll learn the details behind Slovik’s execution, and how Dwight D. Eisenhower himself decided to act, given the evidence. You’ll also learn that even today, there’s more to the story than what was previously understood. Meanwhile, a German panzer spearhead was heading west from Moderscheid, Germany. It was part of battle group SS Leibstandarte “Adolf Hitler,” the tip of General Josef “Sepp” Dietrich’s Sixth Panzer Army. Its commander was Joachim Peiper, a tall, battle-hardened veteran pressing to get to the Meuse River. The American and German columns were fated to cross at a junction just south of the town of Malmedy. …It would be here that one of the greatest P.O.W. atrocities of the Western Theater would be committed. 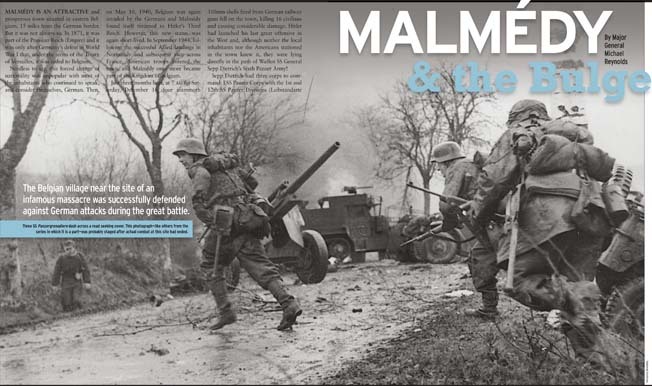 Inside this special issue, you’ll read all about the Malmedy Massacre, not only from our expert writers but also from the men who saw it first-hand. At least 86 American prisoners died on the snow at Malmedy. But why? Was it a random act of violence, or a rash decision made by a desperate commander? Inside, you’ll read all about the events heading up to the massacre, leaving you to decide for yourself. Hitler’s bodyguard division fighting for a key Belgian town in the Battle of the Bulge’s final days. …All this and more inside! In their four weeks of fighting at the Bulge, the Allies suffered 19,000 casualties, with over 15,000 men taken prisoner. It was a pivotal moment in the war, and set the stage for the total collapse of the German war machine. I hope you’ll enjoy these stories, and walk away with a new appreciation for the sacrifices made by the soldiers who fought in the Ardennes in 1944. And please, let us know what you think about this special report after you’re done reading it; we’d love to hear what you think. P.S. Peiper may have escaped trial after the war, but his death was most certainly mysterious. Learn what happened inside, on page 13!